Former Republic of Ireland footballer NIall Quinn with Mick McGeady and friends at the Heritage. McGeady's two round total of four under par 140 gave him a three-shot victory over Dunfanaghy's Seamus McMonagle with Mark O'Sullivan from Piltown Driving Range a shot further back on 144. Day one challengers, Noel Murray of Massereene and Pure Golf Leopardstown's Michael McDermott failed to mount a charge in the second round with McDermott ending the tournament tied for fifth and Murray finishing tied for 20th. "It's a really nice tournament to win, the biggest in terms of prize money on the Pro-Am circuit," said McGeady. "I enjoyed the course but it was tough going at times. The rough was thick, it was difficult to get an iron onto the back of the ball at times." McGeady made a steady start to his round but found water at the par three fourth and walked away with a double-bogey five. He responded immediately with a birdie at the par four fifth, dropped a shot at the seventh and birdied the eighth to be out in one under 37. A dropped shot at the 12, was wiped out by a trio of birdies at the 14th, 15th and 16th and even a closing bogey failed to knock him off the top spot. "That run of birdies was obviously the key to winning today," added Michael. "I reached the green in two at 14 and two-putted for birdies, holed a putt of 15 feet at 15 and then fired an iron into a foot and half at the 16th." The Pro-Am prize was shared between Mark Staunton and Mark O'Sullivan with a two round total of 174. Irish champion Michael McGeady has a two shot lead heading into the second and final day of the The Heritage Challenge Pro-Am sponsored by Aidan O'Connell & Associates Ltd.
Jimmy Bolger will return to defend the Aidan O'Connell & Associates Pro-Am title at The Heritage GC on June 1-2. 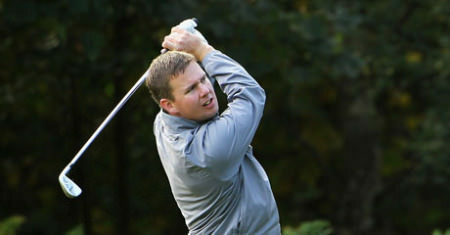 Waterville's David Higgins carded rounds of 68 and 75 to win The Heritage Challenge Pro-Am on Monday. Clontarf professional Eamonn Brady and European Tour regular Damien McGrane shared first prize at the Shell Pro-Am at Carne Golf Links. Michael McDermottMichael McDermott followed his course record 65 with a two over 73 but still hung on to a share of the lead with Ballinasloe’s Mark Staunton and Derry’s Mick McGeady at the halfway stage in the PGA Irish Championship at Roganstown.